Every school now has a requirement for securely storing laptop computers, a simple locker like this one provides an affordable way to store and charge up to 12 of them. 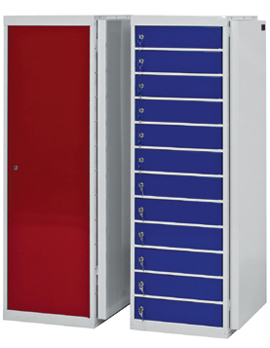 The locker comes with twelve internal compartments that each contain a standard 3-pin UK electrical socket ready to accept the charging lead for whichever brand(s) of laptop your school uses. 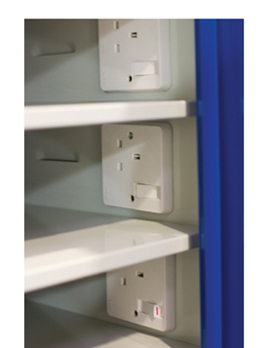 Only a single power lead is required to run the entire locker, which makes it ideal if your classroom or ICT department is running short on power sockets. Choose the full height single door option if you require one key access to all of the laptops. Alternatively you can have 12 separate doors, each with its own key lock.